Take a look at this video from the last School Board meeting, starting at 1:13:25. It’s during the board member comments. Board Chair Lynn Wilson notices that Board Member Kay Fields has left the meeting. “I’ll reserve some time for her to offer her comments when she returns.” Kay never did come back. And that’s no big deal. All local elected officials, myself included, must manage the demands of life and non-public work. Sometimes there are unavoidable conflicts. 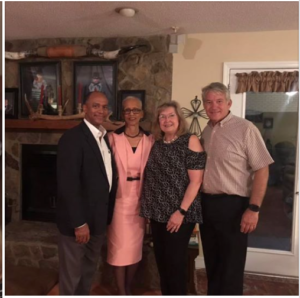 According to multiple sources with connections to the Polk Republican party, many of whom are not happy about it, Kay Fields left the public’s School Board meeting early Tuesday night to attend an unpublicized, invitation-only fundraiser hosted by former Congressman Dennis Ross. If Kay or Dennis care to refute what these sources say, I will happily print it. Here is a link and screenshot of a picture from Cindy Ross’ Facebook page. I want to say this again: I welcome all participation in political competition. If Kay and Dennis want to align with each other, go for it. But I can assure you of this: as your board member, I will never leave your board meeting early to attend a fundraiser — secret or otherwise. I will find a way to schedule my political fundraisers so that they do not conflict with the public’s business. We generally only meet twice a month. This shouldn’t be that hard. The fundraiser kerfuffle comes on the heels of revelations that the for-profit charter industry is paying for robocalls by on Kay’s behalf. The voice of the robocalls is Grady Judd, who was also Kelli Stargel’s prime television surrogate on ads that ran during the summer. As a whole, Kay Fields’ term on the Polk School Board has coincided with an endless attack on the quality of life and educational experience for kids and teachers in traditional neighborhood schools. In the abstract, it is curious to see Kay align herself with this order. She complains about Tallahassee and its mandates as much as anybody else. She was at the meeting when the Board of Education humiliated and mocked Superintendent Jackie Byrd back in 2016. Here’s the “fun” video. And yet, in Kay’s time of personal political need, she is very willing to take the active and assertive help of the very interests and people who humiliated Superintendent Jackie Byrd in Kay’s silent presence. She’s very willing to take the help of people who have actively hurt our kids and teachers for a generation. That’s because this alliance of the crumbling establishment has nothing to do with beliefs, or ideas, or job performance. It doesn’t matter if you’re right, left, or center. Those concepts don’t really exist anyway. This is about who gets to be the leadership class — not what the leadership class does. What is important to you is not important to them, whatever it is. I promise you. And if you doubt me on this, take a look, again, at how that leadership looks at you as a citizen, whatever you believe. Think of how Kay’s desperate decision to skip out on public meeting for a fundraiser fits into the mindset that follows. Let’s start with Education Commissioner Pam Stewart’s lunch. By now this video is infamous for Florida education stakeholders. But it still gets better — or worse — every time I watch it. Bottom line, Pam Stewart has been dodging questions for a year about rigged teacher tests that are helping drive the teacher shortage. Reporter Katie LaGrone finally corners her. What happens next is one of the most spectacular fits thrown by a so-called leader I’ve ever seen. Stewart issues multiple angry complaints about LaGrone interrupting her lunch. I’ve know many 8-year-olds with greater poise and self-possession. Watch the whole thing — or fast forward to the end if you want to see Stewart do her thing. And keep this in mind, the same Board of Education that humiliated Jackie Byrd and tolerates this behavior from Stewart just unexpectedly reappointed Stewart her last night for a year — after she had said she was retiring. See this story. The Tally establishment is doing this in an effort to thwart any change this election brings and protect their dying grift. And Pam Stewart will continue to care more about lunch than the teacher shortage. If Pam Stewart, Florida’s top education official, has apologized to the public or even addressed her behavior in any way, I haven’t seen it. Shows you what kind of person she is. And what you can expect from her in the coming year. Listen to Kelli in this clip and think about how it applies to Kay’s decision to skip out on the public in service of political fundraising. And Kay did, literally, skip out on the public. Public comment came after she left. She missed it for the sake of the fundraiser. Among the people who spoke were the parents of Terissa Gautney, the special needs child who died last year on one of our school buses in a terrible tragedy. Rightly, Terissa’s parents came to prod the district on its reforms. They wanted an update on what we’re doing to make sure this doesn’t happen again. I’m not terribly pleased with our answers. Again, you see in these attitudes an indifference to the public that the public itself must change. Kelli Stargel put this attitude on beautiful display in that clip above, when I asked her if she would attend an important Polk School Board meeting. In that meeting, we had to address Kelli’s mandate to close, destroy, or turnover to private hands several of our schools because of their fraudulent school grades. I came to call this list of schools “the Kelli Stargel school kill list.” Full background and discussion here. And now listen to Kay herself. This is her response to learning about the context of the Tenoroc High tragedy that has been a blight on this district for more than a year. That passive attitude — that unearned deference to power at all times — has defined the educational leadership class in Florida for a generation. Their motto might as well be: as long as we’re in charge, ¯\_(ツ)_/¯. Kay Fields has been a passive and ineffective part of a tired leadership class for 16-years. Her career coincides with the public legislative careers of Dennis Ross and Kelli Stargel, both in Tallahassee and Washington. If you think that 16-year period has been good for public education, our kids, and our teachers, you should vote for Kay Fields and Kelli Stargel. Because they have no intent to change. In Kay’s case, she has complained ineffectually about what Kelli and Dennis and the for-profit charter industry has imposed over the years on our teachers and kids. But when the money is on the line, when her largely symbolic role in that leadership class itself is in question, it’s extremely telling who she skips out on the public to go hang out with.